Corvallis, OR - Saturday, Feb 1, 2020 Afternoon Start! Pull out your old prom dress, tux or favorite costume formal wear and join us for a Winter Formal Fun Run! Corvallis, OR - Saturday, March 16, 2019 Afternoon Start! The Beaver Freezer is owned by the Oregon State Triathlon Club. This race is produced entirely by students, most of whom are undergraduate students! Our role in this event is providing guidance to the student race directors and coordinators as needed. You will often see us out there on race day volunteering and helping as needed. Sometimes, we even get to race! Blair and Staci each directed the Freezer in the past and are members of the OSU Triathlon as volunteer coaches. 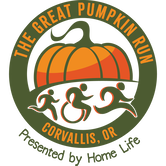 The Corvallis Half Marathon and 5k is owned by the Corvallis Rotary Club after 5. Our role in this event is assisting with participant communication, course operations, and consulting services. The Timberline Marathon is owned by RaceWire. Our role in this event is assisting with course operations. Cover the long course (Iron) triathlon distance with up to 10 of your friends over 3 days! Swim 2.4miles Friday evening, Bike 112miles Saturday and Run 26.2miles Sunday. Each leg of this race is split into 10 or more laps for you to divvy out however you'd like. Free camping, food and a party every night. Come try out this social relay event that is like nothing you've done before! If you had to pick one race this year… This. Is. It! Nestled in the foothills of the Cascades and fed by the Santiam River, Foster Reservoir offers premier recreation facilities to the outdoor enthusiast and an excellent location for a triathlon festival. Swimmers are welcomed by end-of-summer water temperatures of a comfortable 70-73F. Miles of low use roads wind through the hills and along the river, providing an exhilarating ride for the cyclist. Following the wooded shoreline, the run course offers relief from the summer sun. To top off your race experience, we put on an awesome post race party! You won’t find cheap, minimal food at the finish line of our race. We put together a huge BBQ with local produce just for you! After you fill up on delicious food, top it off with an ice cold beer or beverage on us, and enjoy the live music and awards ceremony. With a family friendly atmosphere and races for all ages and abilities, you’ll find yourself hanging around for the whole weekend. A large, well kept campground is the final component of the equation for the ultimate triathlon festival. We hope you will join us! The Great Pumpkin Run is owned by HomeLife. Our role in this event is assisting with course operations and consulting services. ​The Beaver Fever is owned by the Oregon State Triathlon Club. This race is produced entirely by students, most of whom are undergraduate students! Our role in this event is providing guidance to the student race directors and coordinators as needed. You will often see us out there on race day volunteering and helping as needed. Sometimes, we even get to race!